Illogical practices – Have We Had Help? …no, wait a minute. That’s not strictly true. I’ve been thinking for several years now about why today’s generation don’t read as much as my own did, and still do come to that? For instance, why do so many of the one, two or three star book reviews on Amazon and other internet book sites, often written by ordinary members of the public, focus on how any given writer approaches dialogue between characters in particular? Why is it that they they feel obliged to go on the offensive? I believe I know why. Today’s generation relies heavily on visual images such as in films, on television, and even via the Internet, particularly channels like YouTube, for any story to have a chance of gaining their attention.Think about those annoying video clips some writers are forced to put out by their publisher in the vain hope of attracting prospective readers? If you want a for instance, I’ll give you one! Think about how today’s generation believe that a book’s cover is all important, and not the text! They want to see pretty pictures not words! Think about why so many writers offer up their latest work’s cover for scrutinization across all social media platforms these days? Once again in a vain attempt to attract today’s generation, that’s why! Quite frankly I can see a time in the not too distant future when illiteracy becomes the norm unless today’s generation buck up their ideas, starting with losing themselves in the pages of a book! My friend and fellow author Bob Van Laerhoven reminded me of how vital the cover is these days, when he asked me the other day if I had thought about the cover for my work in progress Autumn 1066 yet? Even though we were both joking about it, we know that for it to sell, it will either need a scantily clad buxom young Saxon or Viking female, or a muscular Saxon or Viking warrior in his prime on the cover for it to even be considered by today’s generation! Whether we like it or not, PULCHRITUDE IS WHAT GAINS ATTENTION AND HOPEFULLY SELLS BOOKS TODAY!!! It’s my contention that because of the highly visual age we live in that today’s generation have completely lost the means to emerse themselves in anything written down, such as a book, unlike my own generation who were brought up on the written word. In other words quite literally they must have everything spelt out for them visually. “What do you think Beadurof?” Colby wondered. Aldred bit his tongue as he fought hard not to smile. Because of Cynric’s tender age and slender build, his nephew could so easily be mistaken for a young female from behind at a distance. Smirking, he briefly glanced in his direction. Cynric’s face flushed bright red with anger at the good natured jibe by one of Aldred’s oldest friends. As a member of today’s generation, its incumbent upon you to tell the rest of us why you find it so difficult to do the same damned thing when reading, instead of wanting it spelt out to you on a silver screen? Seemingly it’s something today’s generation are incapable of! It would appear that for them to be able to understand the above example at its most basic level, requires that they actually hear the characters speaking, and not via the medium of imaginary voices in their heads. Plus they need to be able to see the characters portray their facial expressions and both their physical and emotional reactions. I have only this to say on the subject – wake up idiots! What you want is utterly impossible to achieve in a book. Reading a book requires your participation as well. All you have to do is use your imagination! For your information the difference between a book and a visual interpretation of a story via a film or television script is that the former asks you to engage your brain, or if you prefer it – your mind’s eye. Whereas the latter does not. In that instance, all you need to do is to sit in a vegetative state in a darkened room eating popcorn while staring at the silver screen!!!! In my defence, I only ever do that when creating the back story. I’m about to disappoint the particular individual once again, when I tell them here on my blog in front of witnesses (metaphorically speaking that is) that my historical adventure Autumn 1066 will be no different. Without a descriptive background constantly running throughout the book it just won’t work. So, you can either like it or lump it while eating your Païdakia my friend. The one thing that every writer, whether traditional or Indie, whose books are published in e-book form have in common, particularly in non American markets like here in the land of the literary curmudgeon where the printed book is still preferred, is the vehement prejudice against the relatively new publishing format we choose to use. Because they hate the idea of the e-book, they are missing out on so many great tales. Whether they like it or not, the e-book is the next evolution in the history of publishing. As far as they are concerned, if they can’t hold a book in their hands and physically turn the pages, from their completely illogical point of view the electronic file is not a proper book. I wonder if any of them realise how totally irrational they sound? Whether they like it or not the e-book is here to stay. Before the first seed change in publishing occurred when the printing press was introduced to the UK in the fifteenth century by William Caxton, the only way itinerant storytellers could pass on their stories was by word by mouth. What the printing press did was to collect their stories in one place, the printed book, for everyone that could read and write, long after the stories would have disappeared when the storyteller eventually died. Despite the gate keepers, today’s storytellers can be published in a format available to literally everyone who owns a smart phone, laptop, desktop, tablet or a purpose-built ereader such as the Kindle. What the traditionalist stick in the mud’s simply fail to understand is that they are a rapidly diminishing minority. From the point of view of today’s publishers, it makes good financial sense to publish in e-book form rather than paper. This is a second seed change in publishing that is slowly being accepted by all five major publishing houses. From their point of view, if an e-book doesn’t sell they haven’t lost much financially, unlike remaindering, where to sell the printed copies in stock they have to offer them at a much cheaper price. Either that or pulp thousands of them after taking a financial gamble on what they thought would be the next best seller. A thought just occurred. Maybe the reason why curmudgeons hate the e-book so much is because they cannot bend the ereader back on its spine like a paperback, nor fold the top corner of a page over to act as a book mark. What do you think, am I right?? Why do all author interviews fail miseraby? I’ve read literally hundreds of them over the decades. Without exception they follow an inevitable mind numbingly boring formulae. I’m sorry, but the last thing I wish to know about is an author’s favourite book, or where they live and with whom. Or even what their latest book is all about and other entirely banal questions!!! What I really want to know is how their mind works. Don’t you? To begin to gain an insight into what makes any author tick, all you have to do is read their books for yourself. It couldn’t be simpler! Do that and there is no need for the totally redundant author interview. Each and every single one of us reveals far more about ourselves in our storytelling than any damned interview ever will. You just have to have the intelligence to sift out the often unconsciously inserted clues which we leave about ourselves by the way we write the text. Believe it or not but actually reading our blog posts (not just liking them) will also help you to get to know something about us you never knew before as well. Only a publicity seeker (you know the beast – those who refer to themselves as Author Bill or Belinda Smith across the entire social media system) will ever delude themselves into thinking that by having taken part in an author interview, that somehow or other, by osmosis their book sales will automatically increase. What total bunkum – they won’t! Book sales still only occur after someone has actually bought and read your work, and told their friends about it. Granted, these days they may have been initially attracted to it by its often lurid cover and quite possibly, its range of good and bad reviews. If you are a fellow writer, take my tip, get on with your writing and forget about participating in any interview until the questions on offer show a far higher degree of intelligence. As far as I can ascertain, the day when interviewers pluck up the courage to dare to break the mold and ask truly pertinent questions of their interviewees, is the day when hell will finally freeze over! Without Reviews Books Don’t Sell! I’ll say it again – without reviews, books don’t sell! Sunday last I posted about a perfectly good, balanced review for my latest science fiction romance Céleste that Amazon refused to allow because its author and I know each other. Since then, thanks to Derek Haines telling me how, it now appears as an Editorial Review on Céleste’s page on Amazon.com. It’s bad enough that many people today don’t want to read a book. But for those that do, the number who take the time to acknowledge the book they have read by posting a genuine review are rarer than hen’s teeth. It doesn’t help matters when Amazon deliberately remove reviews willy-nilly, under the pretence of doing away with fake ones, while at the same time bending their own rules, when they openly offer professional reviews for a price. So how can they possibly justify their actions while removing reviews written by perfectly ordinary readers who bought and enjoyed any given book? The mind simply boggles at what can only be described as Amazon’s blatantly obvious double standards where reviews are concerned. Thanks to Amazon belabouring the fact that eBooks are electronic files, the concept of never paying for any eBook written by an Indie has become the norm. How many of you feel guilty about reading that eBook you got for nothing? More to the point, how many of those free eBooks you downloaded, have you actually read, let alone reviewed? Doesn’t it bother you that the eBook’s author invested several months, or in some cases, years writing it? If not, it damned well should! It’s high time you all grew a conscience and put yourselves in the author’s place for once. After all, would you go into work if you knew that you would not receive a salary for your hard work? Of course you wouldn’t! More fool us for loving the written word, to the point where we sweat blood like you wouldn’t believe to bring you that latest book. Common decency demands that we are owed monetary recompense for all our hard work in the form of royalties, no matter the price of the book in question. Unfortunately these days most Indies are lucky if their titles sell in the dozens per annum. Thanks to Amazon’s penny pinching change in how they pay royalties, known as KENPR or Kindle Edition Normalized Pages Read, combined with your own selfish attitudes towards the product of our labours, if any writer thinks they will become rich these days, they’re seriously kidding themselves. We’re no different to you in that we need money to survive, but thanks to Amazon and uncaring people like you, 99.999% of Amazon’s Indie authors consider themselves lucky if they make maybe a couple of hundred dollars yearly from writing. Remember this tightwads – authors never receive royalties from those free copies you all greedily help yourselves too. PS – if you agree with me, reblog this!!! Ok, own up! Which total numpkin came up with the bizarre concept of daylight saving? The clocks here in the UK went forward in the early hours of yesterday morning (Sunday 29th). Why it was decided that 2am is the appropriate time to make the change totally escapes me, let alone why it happens. But there you are. Until voters around the world demand their respective governments get rid of it, it’s here to stay, more’s the pity! Truth be told, some bureaucrat probably drew a number out of his hat to decide what hour was best for the change over, after another of his kind had first decided that mucking around with time was a good idea. It wouldn’t surprise me in the least if the latter of the two received an award for coming up with the totally nonsensical notion! Face it – we’re all idiots! Who actually benefits from changing their clock? No one! Those who swallow the myth that we somehow gain because of it, quite frankly need their bumps felt. The number of hours in a day remains exactly the same, no matter whether its during the daylight saving period or not – 23 hours, 56 minutes and 4.1 seconds, plus or minus a few thousandths. Yes it is true that we gradually experience more hours of daylight during the summer months. But it has absolutely nothing to do with putting our clocks forward by an hour. Conversely, putting our clocks back in autumn does not change the number of hours in a day either. Instead, summer and winter has everything to do with the angle of the Earth at a given moment in time when it is rotating around the Sun. I hate to point out the patently obvious here, but moving a clock back or forth by an hour achieves absolutely nothing, except to fool the totally thick among us into believing they are getting something for nothing. Think about it folks – does the Earth speed up as it travels around the Sun to comply with big businesses demands on you the worker? No of course it doesn’t. So why does every nation insist on doing it? Who actually benefits from this grand illusion? Certainly not the general public. Nor the business world, truth be told. No amount of clock changing governs when we go to bed or wake up. We sleep when we’re tired. We wake up after we have rejuvinated ourselves in the arms of Morpheus. No amount of putting our clocks forward an hour in spring time and back in autumn, will ever change that! We still work the same amount of hours each day. Changing the clocks back and forth doesn’t change that either. So, come on people wake up to the total absurdity of Summer Time. You know it makes no sense whatsoever. So why change our clocks for goodness sake? It is yet another pointless exercise which has become an accepted part of life. If you want to celibrate anything connected with summer and winter, observe the equinoxes, the time or date twice each year when the sun crosses the celestial equator, when day and night are of equal length, approximately on the twenty-second of September, and the twentieth of March each year. Now that makes total sense, unlike the clock changing codswallop! What most people forget, especially bureaucracy, is that time is a constant. Mankind cannot change it to suit itself, no matter how much it kids itself, believing it can. 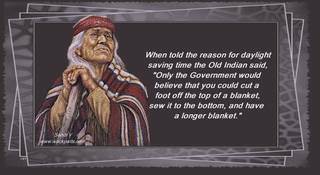 PS – if you are one of the half wits who actually believes the fairy tale known as daylight saving, I apologize for bursting your collective bubble with rationality – not!